For our last sneak peek, we have Gina's Free with Three set " Tropical Windows". Want to create some quick cards? Grab these framed flowers with the included "anytime" greetings and you're good to go! and, our CenterStage Spotlight Design Team member, Sue Morris is joining in on our previews today showing off a card she has made with the new Free with Three stamp set - Tropical Windows. Don't forget to join us at our Release Party to night over on SCS starting at 7pm CST. There will be contests, challenges, lots of chatter as well as a ton more samples shared by the Senior Design team members and our CenterStage Spotlight team too! You won't want to miss it! This first sample shows several of the images in the kit stamped in Vivid Coffee Bean and colored with Copics. I curled all the leaves with my fingers by bending them down the stem and them pulling the edges outwards, this gives them lots of dimension. I stamped the "Inspiration Mosaic" onto the Pumpkin Spice Cardstock in Versamark so I could just make out the lines, and then stamped my dashed line from the set over it, by aligning it first with the line on my acrylic block, and then lining that up over each of my stamped Versamark lines to get this "stitching"! It went easily and quickly, and look how straight they are! (I'll be sharing a tutorial with step by step pictures of this later) I love the homespun feel that gives, quilting without cutting! Some bold leaves from the set are randomly stamped onto the Pumpkin Spice to give it a little bit of a pattern like a printed fabric. The edges of the mats were distressed and the sentiment is stamped onto Green Apple and popped up. On this second card, pumpkins and sunflowers are colored with Copics and popped up on the Chocolate Kiss background. It may be hard to see in the photo, but I stamped the Chocolate Kiss with "Inspiration Mosaic" with Versamark here too, this gives it just a subtle pattern that keeps it from looking "flat" as well as helping me in the placement of my elements(follows the Rule of Thirds), and ground my images so they don't look like they are "floating" on the open space. (The greeting from the set is placed over one of the frames, the pumpkins over an intersection, and the flowers over the other top box.) I did a little faux piercing with a brown marker on the sentiment card and added a copper brad and some ribbon, both from the kit, this striped one is my fave, so many beautiful colors to go with it! Our CenterStage Spotlight Design Team member, Dawn Lusk is joining in our previews today showing a card today too. Remember to check out StampTV for the new video today - Gina will be showing a project made with the new Signs of Autumn StampTV kit! Tomorrow we'll have our last peek and then the big party on SCS Thursday night! woo hoo! Sneak Peek: Timeless Treasures and Are We There Yet? Today's first sneak peek uses Theresa Momber 's "Timeless Treasures". You will love this collection of vintage images, perfect for collages, ATCs, nostalgic scrapbook pages, or "pretty cards"! I had an idea to spotlight the beauty of each her pieces in the "Inspiration Mosaic" I peeked Sunday, this way it reminds me of curio cabinet or printer's drawer. This card is just two layers! I began with a base of Pure Luxury Chocolate Kiss and a Soft Sand mat. After stamping the frame in Vivid Coffee Bean I masked around the border and stamped a quote from this set all over the frame in Antique Linen Distressing ink (click for close up you will see some words peeking through!) and then swiped the pad all over to create a worn patina. When you remove your mask, you still have this beautiful clean border that really makes your stamping pop. Next I stamped the images into each section and colored them with a few browns and a gold just a bit darker than the CS, and added shadows with a warm gray. I pieced the clock face with some Pure Luxury Ivory, and added a few highlights for shine on the chain and key and to the hour glass and bifocal lenses, doesn't that make it look like real glass?! Much more than if you'd stamped on white paper, on this Soft Sand neutral the reflection really pops and makes it look transparent, so don't be afraid to go a little darker with your cardstocks when you are stamping your images to color. "Memories" from the set is stamped on the bottom. I love how the boxes also compartmentalize each piece like a separate memory. ("Memories...in the corners of my miiiind..! LOL! ) At first glance these sets don't seem like they'd go together, but I am just beyond thrilled with how this card turned out! TIP: I did NOT mask the watch, just stamped it over the grid. To get rid of where the lines went through my image, I went over them with the Inkssentials white pen and colored as normal with my Copics, a perfect fix! This works on a light colored CS, try it! The next peek uses Rupa Shevde's "Are We There Yet?" Full of travelling images, I chose to paper piece this "good times van" with some Basic Grey Sultry DP and popped it up. The little leafy branches from "Tropical Flowers" were a perfect match for the DP so I added a few of those to the top to complete the scene for an off-roading adventure to go with the trail-blazing quote! How's that for a girlfriend's getaway or "just be you!" card? The sateen flowers were colored with Copics to match. Cardstock is Pure Luxury White , Chocolate Kiss and, how do you like this new juicy Green Apple releasing this month?! It is the perfect green, I could eat it up!! More peeks tomorrow! Are you loving this release so far?? and, be sure to check out our CenterStage Spotlight Design Team member's blogs for a card made with Timeless Treasures by Shannon Bracken and Brenda Turner has a card to show us that she made with the fun Are We There Yet? stamp set too! Above I've stamped it in Vivid Coffee Bean on Pure Luxury White and colored a few select areas with Copics (don't be afraid to leave some white space!) and stamped in some more little squares to add interest (the row of squares and single square are separate images). This gives the feel of stained glass or a gallery print, my husband (former architect) loves this card. I adore these earthy colors, the grid makes adding hues for color challenges a snap! Card base is Pure Luxury Green Apple (Pale Olive Copic is a beautiful match! ), you will love this juicy new color! Here it is vertically, I've stamped in Coffee Bean again on a sheet of Basic Grey Offbeat DP, now it looks like a floral screen. See how each part of the print is showcased in a pleasing way? I have a new "sketch" without having to do all that layering! All I had to do was add the sentiment (love how it's framed up instead of "floating") and a little white flower embellishment, and the little "brads" you see in the top and bottom corners are circle stamps in the set! And last, I've turned it one more time and created this simple scene with some of Gina's "Tropical Flowers" branches in Memento Tuxedo Black on Pue Luxury White and a bit of sponging olive, yellow and rust inks, masking the "top layer" rectangles before sponging so my greetings would really pop. Isn't that serene, like you're looking out a window? The dashed lines are also in this set, these are fun to add anywhere you need a little something and can also be used like stitching. Card base is the new Gina K Pure Luxury Pumpkin Spice. Our next peek is Nina Brackett's "Elegant Post", which features you guessed it, a post and lots of things to hang up! Here I wanted to add more plants to the scene to go with the potted flowers, and found Rupa's ivy from "Easter Blessings" was a perfect fit. I stamped my post in green to match the new Green Apple Pure Luxury CS and stamped the vine over it and colored with with Copics. I didn't have to mask it since the green colored leaves hide the green of the post! I punched the threading water border on the side to allow my green CS Cuttlebugged with the Leafy Branch folder to peep through. Sentiment from the set is framed with Petite Oval Nestabilities. White is Pure Luxury. don't forget to check out our CenterStage Spotlight girls joining us in Previews today: Sue Walsh is showing an Elegant Post card today and JenMarie Taylor has a card made with the new Inspiration Mosaic stamp set. Thank you again Cammie for creating this set to go with our favorite resident physician!! Along with lots of other hospital "stuff", of course.. I made this card for a friend who had surgery, not a minor procedure, but nothing risky, she was expected to be fully recovered after a few weeks of rest so I thought she'd enjoy this little card with the ambulance and die cut heart! Add a little red rhinestones for the flashing light if you're looking for some "medical bling" LOL! After coloring it with Copics and popping it up I made a little whoosh mark behind it to make it speeding by and stamped the "Get well!" all over my Kraft paper. This is a "stacked" greeting (meaning "well" is positioned below the "Get" in the rubber) but when you stamp it in rows offset like this when you stamp it also reads "Get well!" across, see what I mean? I love Kraft, with red, white and black (both Pure Luxury) one of my favorite color combos. I added some white brads to the corners to finish it off. Tomorrow the peeks start!!! I love, love, LOVE this release! Here's a really easy card to make with "Wee Tees", I was inspired by one of the fancy corner punches I have and how they look like little wings, thought they'd be adorable paired with the onesie and little halo (traced with the Stardust pen) in this set. Card uses Paper Temptress Metallic Amethyst with White Diamond, and the floral background and pieced onesie use the Gina K "Springtime in Paris" digital pack. The DP actually started as a square; I cut around the flower pattern through the middle and then spread it out to reveal the white underneath, to resemble billowy clouds. Last, I added a few white paper flowers and Basic Grey buttons. Today I have a new project from Selma using "Arranged with Love". She colored it with peerless watercolors and then embossed it all with Iridescent Ice powder to give the whole front this beautiful shimmer. The card opens to reveal this handcut assortment of blossoms from "A Year of Flowers", isn't that amazing?! This is a card I'd love to be there for when the recipient opens it to hear the "ooooooooooooooh!!" Sentiment in the Nestabilities die cut is from "Say it with Flowers". Love the details like the piercing around the frame, punched border and embossing. Another top notch project, Selma! FAVORITE TECHNIQUE: I love to do any stamping technique. If I hear about a new technique I am anxious try it out. If I have to pick one, I guess I would say to color because there are so many ways to do it; using markers, water coloring, colored pencils, chalks, brayer, embossing, etc. I also enjoy cutting out my stamped images. COLORS/COLOR COMBO: My favorite colors are lavender and green. I usually prefer pastels but because I love to color flowers, lots of bright colors are beautiful too. I really like to blend Barely Banana and Pretty in Pink on flowers. FAVORITE GINA K SET BY MELAINE: I think everyone knows my answer to this one -- “A Year of Flowers”. I also love “Just So Hippy”. FAVORITE GINA K SETS (FROM ANY ILLUSTRATOR): Any flower set for sure. I love Asela’s “Flowers for Daisy” set. This was the first set I bought from Gina. I have had a lot of fun with Theresa’s “Out West” set too. I also love using the two StampTV kits I have. Well I could keep going because I have so many favorite Gina K sets. CRAFT SUPPLIES I CAN’T LIVE WITHOUT: I love to use my Nestabilities and Cuttlebug embossing folders. I also love good quality cardstock and Basic Grey paper pads. You can’t leave out all the ink pads and coloring tools. I also need ribbon and all my embellishments such as pearls, rhinestones and brads. I’VE BEEN STAMPING FOR (HOW LONG): The first time I heard about stamping was before there were many stamp stores and there was no Internet. Some guy was sitting at a booth at the mall one day and wanted to show me embossing powder. I was hooked and have been stamping ever since. I signed up as a SU Demonstrator almost 10 years ago and have taught monthly workshops in my home. I GET MY INSPIRATION FROM: Lately it has been doing StampTV challenges and viewing all the fabulous galleries. Prior to StampTV, I used to hang out in my favorite stamp store discovering new products and techniques and often signing up for classes. I also enjoy reading stamping magazines and reading blogs. THE MOST IMPORTANT THINGS I’VE LEARNED ABOUT STAMPING/CARDMAKING ARE: The joy it brings to me and so many others. I believe the most important thing I’ve learned is the joy in sharing ideas and teaching others what I have learned. Another thing I learned is how many wonderful friends you make with other stampers. It is a strong supportive community. SOME OF MY STAMPING/CRAFTING GOALS ARE: I would love to be a full-time design team member some day. I have really enjoyed being on the Center Stage Spotlight Design Team this month for Gina. FAVORITE THING TO MAKE THAT AREN’T CARDS: I really enjoy making/covering boxes. I don’t make as many as I should. I have had many cards published in “Stamper’s Sampler”. Stamper’s Sampler, “Take Ten", also published a four page article I wrote, titled “Make 10”. I have been published in the SU “Stampin’ Success” magazine. After becoming a member of StampTV, Melanie featured me as her Guest Floral Designer in May. I was featured in the first StampTV Center Stage. Melanie asked if I would be her Guest Designer for her new “Arranged with Love" set. I was so honored she would ask me. The beginning of this month I was selected, as one of six, to be on Gina’s Center Stage Spotlight Design Team. I have always thought it would be so much fun to do this so was extremely happy I was selected. Another accomplishment has been that I actually figured out how to start my Blog “Selma's Creative Corner“. It took some help from my StampTV friends, but it is up and running. I do not know that much about computers so this was a big accomplishment. Here's a simple onesie card created from "Wee Tees" and my "Hip Hop Accessories" set. I put together from the sentiments fro both sets to make "world's Hoppiest Baby"! (this would be either of my sons who could almost touch the top of the door frame in their Johnny Jump Up when they were little!) Isn't that little Joey sweet on the tee? I embossed a rectangle and then hung the onesie up with my hanger from "Little Tees", along with an adhesive metal dot like a tack to the border. Round tag is popped up. Cardstock is all Gina K Pure Luxury. Gotta bounce (stamp!) I am busy getting ready for the Gina K Designs release next week, woo hoo! Hope your day's a hoppy one! Today I have a card I made after my "Sporty Accessories" set arrived. Sports themed papers in just the sports you want can be tough to find, but you can easily create your own background papers with the different elements in this set. I lined up the three large balls on an acrylic gridline block and stamped them on a diagonal on this Soft Sand CS. Then I shifted the block each time I started a new row so the balls would nest together and the same ones wouldn't be right next to each other, until my mat was complete. Next I rubbed my ink pad directly onto the cardstock to dirty it up and give the card the appearanc of texture. Last I matted it onto the Black Onyx and Soft Sand base and added a popped up stamped jersey with the word "Fan" from "Just So Sporty"set. Isn't adding the ball to the shirt fun for a soccer fan? A very simple "kid" or "guy" card! :) Happy Tuesday, thanks for stopping by! Here's a scene I made with Theresa's "Happy Camper" set, as soon as I first saw it, I knew I had to get the s'mores in this pesky fella's hand! I started stamping the picnic table and then masking it to make the mountains behind it. I created the grassy area doing zigzags and quick, upward stokes with a Copic and the shadows on the grass with a darker green. Base is a Pure Luxury Soft Sand. Hazy evening background was done with a sponge and some pink and plum inks. There's no moon or sun in the background this time: if you look at the way the shadows are falling, drawn underneath, the light source would be out in front of the card. Following the line of the stick he's toasting really gives it a lot of dimension, even though the card is flat. Here is a simple card I made with Nina's "Special Fathers". I used Basic Grey Porcelain, Apricot Appeal and Regal Rose CS, and stamped the clock onto Pure Luxury White and colored with Copics*. I created the pieced border with my Scor-Bug and Scor-Pal, then used a brown pen to "connect the dots" and make this faux stitched look! I used a Pretty in Pink base and Basic Grey Bittersweet DP. I also used the Scalloped and Classic Heart and Ribbon Tag Nestabilities. The heart adds little sweetness and frames up the shape of the cone arrangement so nicely. Images colored with copics! Stay cool today, friends, it's hotter than heck here!!! Hello! Today I am sharing card made with a square layout from "So Sketchy" using some beautiful tag elements from our sponsor last month, Ormulo. Even trimmed down the big tag was quite large so to work it into the sketch, I made card 5 x5. I thought "Arranged with Love" would be really pretty with all the flourishes on the two tags, so here's how I reshaped it to fit, as well as making a scalloped mat that was large enough for it. Then I lined the images up to fit the mat, the seam will be covered by my other elements. Isn't that nice how you have border that still matches up all the way around? Refer to finished sample at top! OK, we have a really fun challenge for you today -- it's an inspiration challenge, sponsored by Bombshell Stamps. To play along, simply pick something that you think is "the bomb" and make something! With all the car stuff in this "Kustom Kulture" set, I picked something my 7 year old thinks is the bomb: go karts! I put the flame and squealing tire image together and then found a sentiment to match from my "Tee Talk" set and the jersey from "Just So Sporty" to complete the scene. Post your project in the Paper Craft Planet photo gallery, and use the tag "PCPBOMB". (Here is a tutorial on adding pictures to the gallery, if you need it.) Shannon, at Bombshell Stamps has generously offered TWO stamps sets as a prize -- Pinstriping and Speed Shop. Now, it's your turn! Take the challenge and let's see what you make! Today Selma has created two special gift card holders using "Arranged with Love". She stamped the frame onto Polyshrink and attached it to card (also shrunk down the little flower from "A Year of Flowers" to put over the card in the middle of the bouquet) so the image measures 1 1/2 x 2". Isn't that sweet? (I would love to use some Polyshrink with this stamp sometime and make a key chain, bookmark charm, sun catcher or other.) So pretty! and here you can see how the word window punched middle holds your gift card. A bouquet and a gift card, what else do you need for the perfect gift?! "I stamped the image and watercolored it then cut around the frame. The Summer Sun card stock is 5 1/2" x 11". It is scored at 4 1/4" and 5 1/2" then scored 4 1/4" from the opposite end. When the middle section is folded inside, it creates a pocket for the gift card. I used Score Tape to secure the inside folded part. I use my SU Word Window Punch to cut the opening for the gift card in the center of the inside fold. Flowers from "A Year of Flowers" were added to the inside and a verse added. I used Score Tape to secure the long ribbon across the middle. " Please go visit Selma's blog now for more inspiring projects with this set! Have a glorious day, thanks for visiting! Turn up the heat on this old truck from "The Journey" with a custom paint job, courtesy of two Copic markers, Lipstick red and Cadmium Yellow. (Click for a closeup and copy mine, it's just some wiggles and waves, you can do it!) :) The top of the truck is colored with C1 and C3, and the bottom below the flames is C5, this gives shadow but also adds a cool two tone. C3 underneath the truck for the shadow. A fun way to add a tag or greeting when you use the truck is a metal edged frame with brads like this SU! silver hodge podge, you have an instant license plate! "You're a Classic" is from my "Tee Talk"set. I really wanted clean lines to show off the truck so a clean and simple layout with minimal embellishments was just what I wanted. CS is all Gina K Pure Luxury: Rocket Red, Black Onyx, White and Soft Sand. Here's a sweet and simple card made with "Lazy Days of Summer" (why are none of my Summer days feeling so lazy?!) The ice cream is colored with Crystal Effects and popped up inside the Classic Heart Nestabilities window. Polka dot background is made with Gina's "Ribbon Stripes". More to come!! I have some really exciting packaging and tutorials coming up, can't wait to share! Here is a simple wedding or anniversary card with "Arranged with Love", embossed in Silver Superfine embossing powder, it picks up every little detail in this stamp, and makes this monochromatic card so elegant! I wrapped some Pearl Vellum (Paper Temptress) punched flourishes around the corners and accented them and the Pure luury White sentiment card with some of the 2 and 3mm adhesive rhinestones, I love that delicate sparkle. Blue mat is SU! Bordering Blue (I ran a silver paint pen along the edge of the blue mat to get this double silver border) and card and base are Pure Luxury White. It doesn't get much easier than this! Have a beautiful day! I have family in town right now and we had my older son's birthday party today (indoor rock climbing! yes, it rocked!) so I haven't had a chance to make another sample for any of our Lucky Seven sets (hope lots of you are able to take advantage of this great deal! ), but I wanted to show a few of my favorite projects I created with "Cuddles and Hugs" and "Jumping for Joy" this past year. If you've been following my blog since the beginning you may remember them, but if you've only recently jumped in, they will be "new"! :) (Sometime I only remember making some of these when I look back through my blog archives LOL!) Hopefully I will have some time before the sale ends Monday night to make something else with a few of the other sets in our promo for your inspiration! The first is a beach or pool party card I made with my "Jumping for Joy" polar bear! I used a water background paper and made the beach ball from the set floating. "Congrats on" and "taking the plunge" are both included in this set as well. Geronimo! Did you know: you can scroll down to my labels section of the sidebar on the right and click on any of the categories to see ALL the posts using that a particular technique, stamp set, etc? I went ahead and linked these two sets below so you can see all my projects I've done with these sets at a glance as well. FYI: We will also be adding all my tips sheets for my sets on StampTV for you to download and print out. Coming soon! More Lucky Seven peeks tonight from Jessica, and our Centerstage girls Brenda and JenMarie! For this week's StampTV Potluck Friday Challenge, I am asking you to choose a piece of patterned paper and stamp on it with line art images (not bold), then color the images in. This will work best with a light colored patterned paper so your new colors will show up when you color over it, and selecting shades for coloring that will be also be light enough for the pattern to show through, make sense? Here I stamped "Arranged with Love" on a floral pattern from the Basic Grey Porcelain pack and coolored over the flwoers and leaves with pale pink and green Copics, I like how this creates a "floral on a floral" and gives a pattern to the background behind the flowers instead of just a solid color (without having to cut and piece, yeah!!) I also love how this makes the paper look like a completely new pattern. If you would like to play along, please upload your creation to STV by Friday, July 17th, 8 AM CST with the keyword STVPF21, I will randomly draw a winner and post it next Friday, that person can choose a 23.95 Gina K designs stamp set! Hope you'll enter, you'll have all week! Tomorrow I'll be shairng a few of my favorite cards with my two sets included in the Lucky 7 promotion, along with links back to my stip sheets and all the samples i've made with them! Welcome to the Lucky 7 Special Event from Gina K Designs, being offered for the first time!! OR, for an even more amazing deal: Buy them all for $125! Purchase all of the Lucky Seven stamp sets and you will receive all 4 of the free stamp set choices for free! (A total value of $247.55) If you already have some of these sets, at these prices, they'd make great gifts! 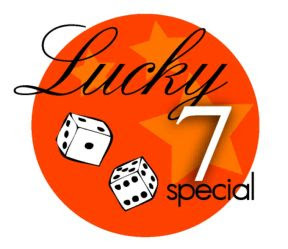 To take advantage of these sale prices, look for the "Lucky Seven Button" on GinaK's Online Store , starting 10PM CST July 9th (that's RIGHT NOW!)! Our Gina K team is sharing projects featuring all seven sets: today I have samples using a couple of my past Gina K Designs releases that are included in this sale, two of my favorite animals sets I've illustrated, the first here is made with "Cuddles and Hugs". Today I created a bookmark using small square punches to capture little cropped vignettes of the different pairs hugging. The punches I used here are 1 1/4" and 1 3/8" square. The images in this set would make fabulous "inchies", but these aren't technically because I don't own a 1 inch punch! (yet! can you believe?) ;) I colored the images with Copics and matted them onto a piece of Pretty in Pink 1 5/8" x 6 1/4"and a Black Onyx mat measuring 1 3/4" x 6 1/2". I added a few black dots next to the greeting with a black pen and a piercing template. All done, easy peasy! My next sample shows some quick lollipop cuddlers (huggers? climbers? call them what you want LOL!) These took even less time! I stamped the images on Soft Sand CS and accented a few areas with a white Koh-i-Noor pencil and cut out. Then I used my double slot punch, flipping the punch over so I could line up the holes with where I wanted them (around the koala's arm and in the nook between the cat tails) then slip my little pop through. My kids got so excited about these I barely got a chance to get them photographed LOL! You could also use a double hole punch, eyelet setter, Cropodile etc, but the double punches are nice because it's one step and the holes are aligned and the right size for the stick. My last sample uses "Jumping for Joy", Zach meets Olivia! (or, colored this way, "Oliver"!) ;) Here they look like they're kicking around the beach ball, it's simple to create interactive scenes between the animals in this set. I colored them with Copics and popped up the ball (this ball fits a 1" circle punch) I added some green, blue and orange sections to the white Pure Luxury base to match the ball, makes it really pop against the otherwise black and white color scheme. This card is for my son, who just turned 7. Now check out these GinaK Designs Senior Design Team blogs tonight for projects made with these seven Lucky Stamp sets! This week Selma created a fabulous shadowbox with "Arranged with Love" (I love making this type of card, but it's been awhile!) They are always SO great for weddings, showers or birthdays because it displays so beautifully: it stands up but can also be smoothed flat to put in an envelope. Here are Selma's directions for creating the box, dimensions and all! "First cut two 6 1/4 squares to make the shadow box. Score the ends at 1/2" and 1". I stamped "Arranged with Love" (black embossed) and colored it with Peerless Watercolors, I also stamped some extra flowers from "A Year of Flowers" and colored them the same way. I attached the main piece to the bottom of the shadow box then started added some of the extra flowers on dimensionals. I cut and curled the petals on the purple flowers. I chalked the background with yellow chalk. For the top of the box, I use my large Petite Scalloped Nestabilities to cut the oval then cut another one, one size smaller to layer underneath (separated with dimensionals). Before attaching the red scalloped piece, I embossed the center of the white panel with the Cuttlebug Textile embossing folder. I then added some more of the cut out flowers on the top to give it more dimension. When you flatten it these flowers line up with the inside. On the rose on the left of the middle tag, I cut out just the bottom portion from a rose to give that some dimension too. I wanted the flowers on the main image to go past the border since it is a shadow box, and I think it looks great that way. I used Scor-Tape to hold the shadow box together. I added a punched border to each side and adhered pearls to the card and along the edges." Selma has another project with this set on her blog, check it out! On today's card I used the "rock and roll" technique to add colors to the dandelion head in Gina's Free with Three Set this month: "Many Wishes" . This is such a great technique for showing off your bold stamps and I almost always do this with my bold ones to give the images more depth! Ink up the stamp in a pale yellow or tan to match the Soft Sand CS, then roll the edges of the stamp on a light gray ink pad, "huff" on it with your breath if you need to moisten the ink, and stamp. be sure not to get the gray ink in the middle you want that other color to show through. Doesn't that look just like the downy spores on a dandelion? Next, ink up the stem in green and stamp it so the top tip meets the middle of the dandelion head. Add the little spores floating away. I chose really narrow artichoke mats to echo the thin stem, and embossed the Soft Sand CS with the Cuttlebug Floral Screen folder. I haven't used this pretty folder that much before, but it REALLY looks like hundreds of dandelion spores, even so more so when you rub some Cream White ink over the embossing. The two tone greeting really emphasizes the word "happiness". "Yesterday is history, tomorrow's a mystery, today is a gift, that's why it's the present." Wishing you happiness TODAY. Live in the moment. Thanks for stopping by! Here is a card made with Rupa's new "100% Sweet" cupcakes, it was too tempting not to add a few sweet additions of my own from "Have a Cookie" , these two sets mix SO well! Can you find them? * (Expect to find me experiementing with M&M or raisin topped carrot cupcakes in the future here LOL!!) :) I colored them all with Copics, cut them out and popped them up onto 1 3/8" squares punched from Chocolate Kiss and White Pure Luxury CS. I made the saffron base from a scalloped Nestabilites die. Sentiment is popped up on a heart Cuttlebug die cut. Accents on the strawberry, cherry and sprinkles done with the White Inkssentials gel pen. Hey, exciting stuff coming up this week: BIG event from Gina K Designs, new Stamp TV videos, and another guest spot with Selma Stevenson, can't wait, can't wait!!! * the sprinkles on the pink frosting and "Baked with Love"